A football Marketing company has a proposed an NBA All Star type match between South Europe vs North Europe which might take place every year at the end of European season. UEFA are very interested in the Idea and the European All Star match might be organized as early as at the end of 2015-16 season. Although its just in the Idea phase yet but with the kind of money this on off match can generate UEFA will be looking into the prospect seriously. The idea is to orgnize a competitive game between clubs from Northern Europe (England, Germany and Russia) vs Southern Europe (Spain, Italy and France). How the teams will be picked is unclear but it is suggested that an online poll will decide which player will lineup for what team. Here are some of the details which were proposed to UEFA. All Star Match between players from clubs of Souther European countries like Spain (La Liga), Italy (Serie A) and France (Liga 1) against players from clubs of Northern european countries like England (Premier League), Germany (Bundesliga) and Russia. Players will be picked through online voting system. There will be huge money incentive for players and both teams to make this a competitive match. The match will be played early at the end of every season. But there are many hurdals in making this kind of match possible, the biggest of which is the fact that clubs and national teams will be reluctant to let their players leave for such match unless UEFA provide full compensation and insurance to clubs incase players get injured. 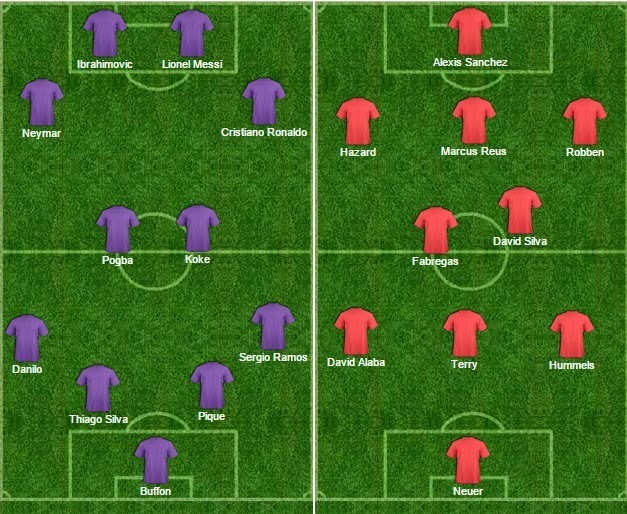 If the match was to happen at the end of 2015 this is how both teams might had looked like. What you think of this idea ? Can UEFA make it possible to orgnize such a game ? will the clubs let their players leave for such game and most importantly what can UEFA do to make this proposed match competitive ? Let me know your thoughts in the comments below.